#VaccinesWork. The latest in a string of major successes includes Australia’s successful campaign to wipe out homegrown cases of the virus. There is no specific treatment for rubella, but it is preventable through vaccination. The disease, also known as German measles, can cause devastating health issues to babies if women are infected during pregnancy. These can include foetal death as well as Congenital Rubella Syndrome which leads to brain damage, deafness, blindness or multiple organ failure. By ending the circulation of the virus, Australia has completed a journey that began in the 1940s when Australian ophthalmologist Norman McAlister Gregg became the first to describe a connection between rubella infection in mothers, and cataracts and other birth defects in babies. This helped spur the development of a rubella vaccine which has helped reduce cases of the disease globally. Australia is not the only country to eliminate rubella. The Americas were declared measles free in 2015. The Western Pacific Region, which includes Australia, is moving closer to eliminating rubella and measles. Singapore has wiped out measles, and Brunei Darussalam and Macao SAR (China) join Australia on the list of newly rubella-free nations. Dr Shin Young-soo, WHO Regional Director for the Western Pacific, said progress against measles and rubella are the fruit of public health investment. ‘It goes to show that when countries have strong immunization programmes that protect against both these viruses, surveillance systems to detect them, and laboratories to test and confirm diagnoses, they can eliminate measles and rubella. Health authorities in Europe have repeatedly committed to eliminating measles and rubella in the 53-country WHO European Region. However, both diseases continue to circulate. Rubella rates are generally much lower than measles, but experts say these diseases could be wiped out if MMR vaccine uptake reaches 95%. Based on 2017 data, 42 of the 53 countries in the WHO European Region have interrupted endemic rubella transmission for at least 12 months. Most have no cases at all and are effectively rubella-free. As a result, cases of CRS are now rare in Europe. The UK, for example, eliminated rubella in 2015. Most European cases are reported in Poland, although some experts have suggested doctors may be overestimating the real extent of the outbreak. 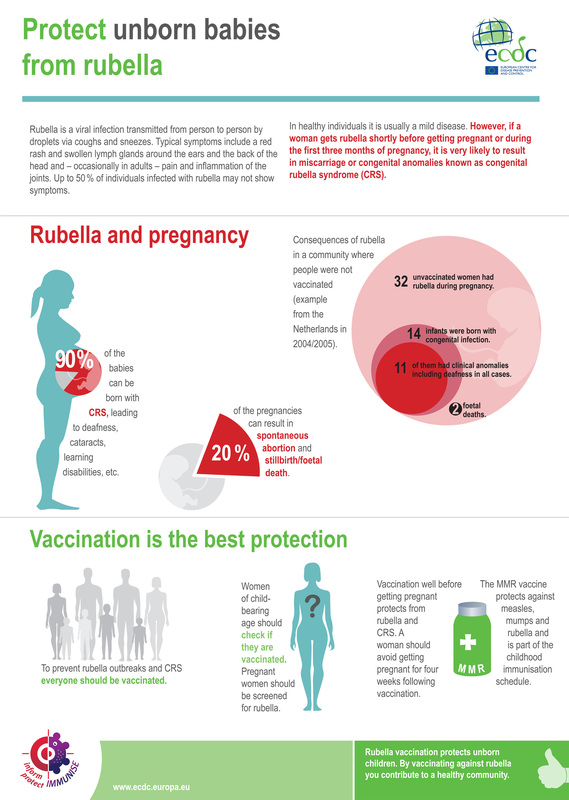 There is no dispute among health authorities and professional medical and scientific societies that rubella can be ended through vaccination. By achieving herd immunity, the virus causing the disease will be controlled.